If you're interested in renting a tent for your party, wedding or any event you've come to the right place! Whether you are seating 30 guests or 300, you can choose from a variety of quality table and chairs. Let us to provide the high quality, table ready china, glassware and flatware for your next event. 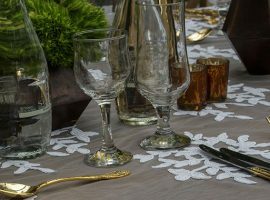 For your exclusive Linen rentals, we choose patterns and fabrics of unsurpassed quality. You have idea for your occasion! We have the party rentals and experience to bring your idea to life. We are so grateful for your continued support of our Thanksgiving feast. This year we served almost 2,000 meals! Thank you for your generosity, we appreciate you so much. Our fundraiser was a smashing success and your service and advice could not be any better. Your linen colors were sharp and matched our color scheme perfectly. Thank you so much for your patience and understanding. Happy Holidays! Thank you so much, once again, for all your help with Light the Night. You and your staff are always such a good team and a joy for us to work with! Looking forward to working with you again. 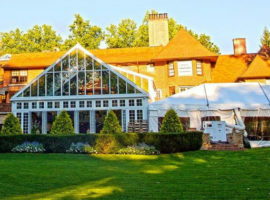 ABC Fabulous Events Party Rentals conveniently located in New York’s Rockland County is a leader in Party Rental industry. The staff at Fabulous Events Ltd. look forward to serving you in the future – In Bergen, Westchester and Rockland Counties as well as in New York City, White Plains and the entire metropolitan area. If you have any questions, please don’t hesitate to give us a call! Visit our showrooms or contact us for all your party and equipment rental needs such as tents, table and chairs, flatware, centerpiece and any catering equipment. We offer the best linen on rental in the market today. Our affordable Caterers Equipment on rentals along with chafing dishes gives you the opportunity to provide hot food as it can be used for reheating, storage and freezing. 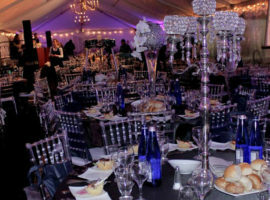 Why Choose ABC Fabulous Events Party Rentals? ABC Fabulous Events Party Rentals is New York City’s premier one-stop party rental company, providing the best service, for every occasion. Whether you are planning a wedding, family gathering, corporate event, big or small, we have party rentals to fit your budget! We specialize in theme-based events and can proudly say that we are the largest source for wedding tent rentals and other event rentals. From planning to layout to color combination and a wide range of products, our aim is to make your special day a memorable one! 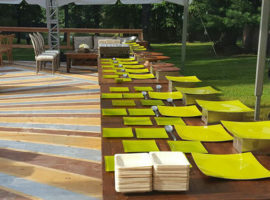 Whether it is an occasion or a get-together, we have an inventory that stands out from the rest in the business.